Japanese Cloisonne Vase with a Yellow-Eyed Dragon on a Maroon Field. Baluster form with silver wire inlay. 9.5 inches, 24 cm. 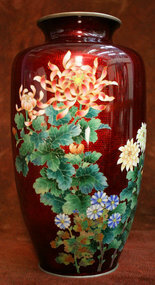 19th Century Cloisonne Vase by the most famous Japanese cloisonne artist, Ando Jubei. Decorated with a band of flowers on a pigeon blood foil ground. Height: 9 inches, 23 cm. 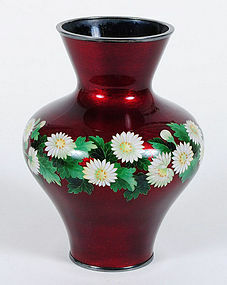 Japanese Cloisonne Vase with elaborate flowers on silver wire over red enamel with foil design. A striking, elaborate work of art and a treasure of exquisite beauty and excellent detail. Height: 12.5 inches, 32 cm. Japanese Late Edo Period Bronze and Cloisonne Phoenix Incense Burner, presented as a fantastic rendition of the subject, with gorgeous colorful inlay creating a great work of art. Height: 10.5 inches (17cm), length: 11 inches (18cm). 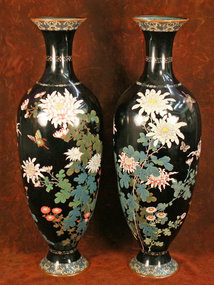 Massive Pair of Japanese Cloisonne enamel baluster vases, Meiji Period, each decorated in brightly colored enamels with butterflies hovering above various types of flowering chrysanthemum bushes, all silhouetted against a mirror black ground, stylized floral bands encircling the shoulder, waisted at the neck and above the flaring foot, and wide abstract foliate bands at the rim and foot (slight damage to the foot). Provenance: Former collection of Mettie C Jones, Long Beach, CA; items reputed to have been purchased at the Twentieth Century Fox studio auctions in 1935, and later MGM studio auctions. height: 47 inches, 120 cm. A wonderful Meji Period Japanese cloisonne vase with an array of flowers on a pale green ground featuring a silverised metal basket weave. Height: 7 inches, 18 cm. 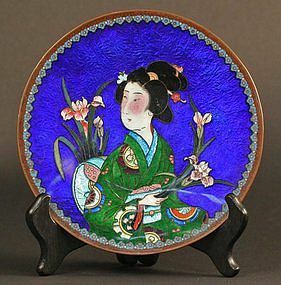 19th Century Japanese Cloisonné dish featuring a bijin (beautiful young girl) holding irises and rendered in the style of Ukiyo-e. This unusual work of art displays stunning colors with rich royal foil background and aspects of foil throughout. It is of the highest quality, with multicolored flowers and foliage. 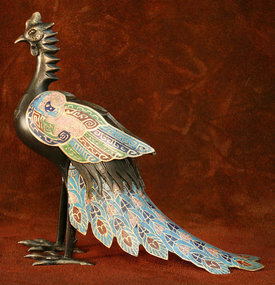 This exceptional Cloisonné is a gorgeous addition for the finest collection. 7.5 inches (19cm) wide. Stunning Meiji Period Midnight Blue Cloisonne Vase in inverted pear shape with lavender and white wisteria design on a midnight-blue ground. Height: 11.5 inches, 29 cm; Circumference: 15 inches, 38 cm. Huge (36 inches, 91.5 cm across!) 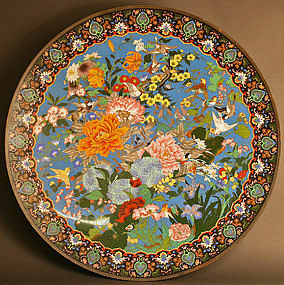 Japanese Meiji Period (1868-1912) Cloisonné Charger with Flower and Bird motif. 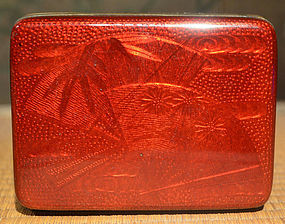 This is one of the most fantastic 19th Century Japanese Cloisonné works we have ever seen. The colors are magnificent and most vivid on a Robin Egg Blue field framed with a gorgeous pattern. The size is amazing and with the stunningly rendered flowers and birds, it makes for a rare, breathtaking exhibitor work of art that will be a spectacular center piece for any home or office. Excellent Condition. 19th Century Japanese Cloisonné Vase of the highest quality in the style of Ando (one of the most famous Cloisonné masters whose works fetch the heights prices). This vase is a masterwork, set in silver wire featuring multicolored flowers, foliage, branches, and birds. 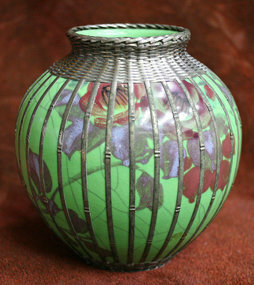 On a rich dark emerald green glaze with foil inlay in a design of bamboo trees. This exceptional Cloisonné is a gorgeous addition for the finest collection. 12.5 inches (32 cm) tall. Excellent Condition. From a prominent and widely exhibited collection. Japanese Cloisonné Elephant Jar. This is a wonderful, charming figure and is an unusual fine example that is a joy to behold. In a circus pose with elaborate fittings. 11.5 inches, 29 cm tall. Excellent Condition. From a prominent and widely exhibited collection. 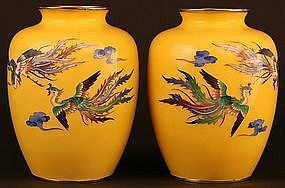 Gorgeous Pair of Meiji Period Japanese Cloisonné Enamel Vases with Spectacular Phoenix and Cloud motif on a rich yellow ground. circa 1890. 6 inches (15cm) tall. From a widely renowned and published collection that has been exhibited at the Metropolitan Museum and Japan Society. Pristine Condition.